– The statute as of 2016 appears first on this page. – The Jury Instructions for most of the main forms of the crimes with which individuals are charged – appears on the second half of the page. 18-3-202. 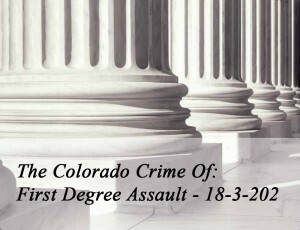 Assault in the first degree. to the detention facility at a specified time shall be deemed to be in custody. sufficient for the voice of reason and humanity to be heard, it is a class 5 felony. of this subsection (2), it is a class 3 felony. officer, firefighter, emergency medical care provider, or emergency medical service provider. if the person is convicted of the charged offense. (b) In addition to any other penalty provided by law, the court may order any person who is convicted of the offense described in subsection (1) of this section to meet all or any portion of the financial obligations of medical tests performed on and treatment prescribed for the victim, peace officer, firefighter, emergency medical care provider, or emergency medical service provider. 5. caused such an injury to any person. instruction and sign the verdict form to indicate your not guilty verdict. voice of reason and humanity to be heard. must disprove, beyond a reasonable doubt, at least one of the above numbered conditions.